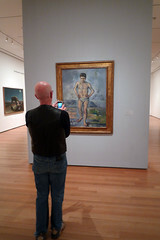 The picture is of a single male in an ambiguous landscape. 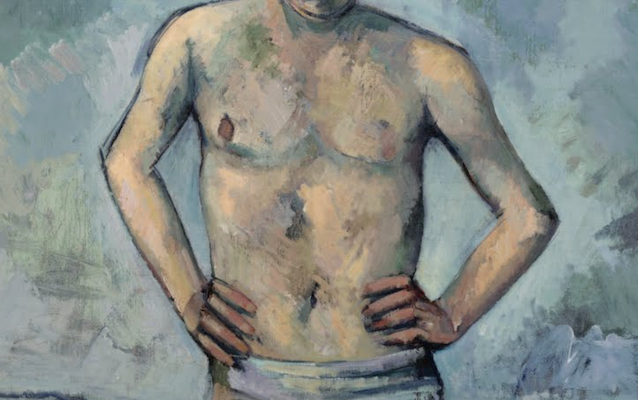 The figure is pushed up to the front of the canvas and he fills it almost from top to bottom. Behind him, deep space is defined, but there is something of a visual tug-of-war going on. 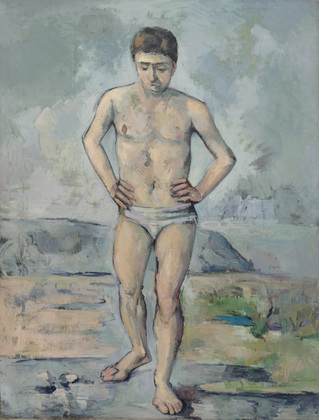 Cézanne has, as is traditional, defined both the near and distant ground planes. Unusually though, he leaves out the middle plane, which intensifies the distance between the fore and back-grounds. The trouble begins when he collapses the two. Look closely at the contour that defines the edge of the figure. Don’t look inside the line that defines the edges of his body, look just outside (see especially beside the right leg). 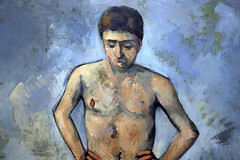 Cézanne has changed the brushwork and color just slightly. It appears that after the background and the figure were finished, he went back and reworked the part of the atmosphere surrounding the bather. The result is an odd shift in distance. The illusion of depth that allows our eye to travel back in space is ruptured as the reworked paint seems to cling to the foreground figure. It is as if the background is lifted forward, attaching itself to the edge of the man like a frame. Why would Cézanne want to destroy the spacial relationships that he has carefully rendered? This sounds like something Edouard Manet might do. Like Manet, it is as if Cézanne wants the viewer to try to account for this distortion—and to engage actively in the picture and its construction. Such questions becomes even more insistent if we look at the rendering of the figure. Clearly this is not the work of Raphael nor of the refined academic technicians associated with the 19th-century Salon. It fact, the figure is a mess. Beyond being generalized, the parts do not seem to belong together. Look at the arms, for instance. The left doesn’t pair with the one on the right. The same is true of the chest and even the face. The legs are particularly awkward. Although one is forward, it is nevertheless far too long in relation to the other. What is the careful observer to think? Has The Museum of Modern Art made a terrible mistake? Have museums around the world given over precious wall space to a charlatan? Cézanne could draw accurately when he chose, but in this instance he consciously chose to disregard tradition and represent space in a manner that invites the viewer to acknowledge both the illusion of depth and the dismantling of that illusion. 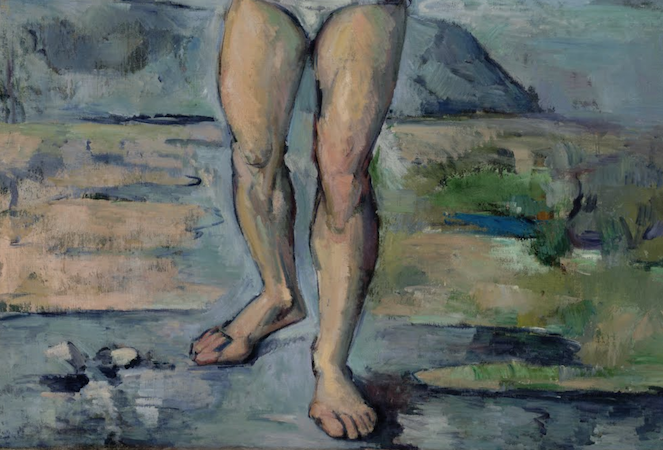 Cite this page as: Dr. Beth Harris and Dr. Steven Zucker, "Paul Cézanne, The Bather," in Smarthistory, August 9, 2015, accessed April 21, 2019, https://smarthistory.org/cezanne-the-bather/.